Capsule Summary: The 4077th treats an orphaned Korean boy who Trapper wants to adopt. In honor of the late Wayne Rogers, I bypassed the random number generator and chose “Kim” to review this week. Most M*A*S*H fans agree that it was the best Trapper episode and a tour de force for Rogers. 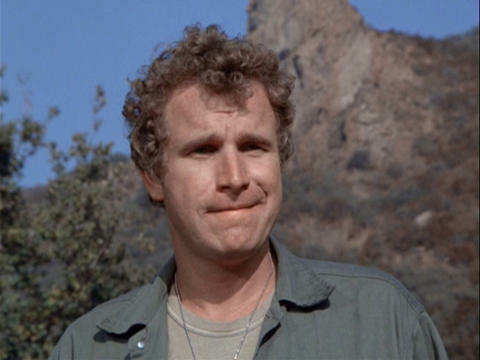 It was one of only a handful of episodes in which Trapper played a central role and was given something substantial to do apart from Hawkeye. It’s also a sad episode. Everyone at the 4077th fell in love with Kim–except for Frank, of course–but to Trapper the orphaned Korean child was more than just a cute kid. Meeting Kim and deciding to adopt him gave Trapper hope. “Up until now,” he tells Hawkeye and Father Mulcahy, “I felt my being here was senseless. For the first time, I think I have a real reason for being here.” His celebration his cut short, however, when Kim’s mother shows up immediately after Trapper risked his own life to pull Kim out of the minefield. The look on his face as Kim is loaded into Sister Theresa’s truck and drives off is heartbreaking. The scene in which Trapper writes a letter to his wife doesn’t totally work for me. I’m not sure why. I think it’s partly because Wayne Rogers was fake writing on his pad of paper way too fast. But it was a decent letter and Hawkeye’s response to what Trapper wrote felt genuine. It’s too bad the episode ended with a corny joke about Trapper adopting Radar rather than discussing why Trapper didn’t want to adopt a different child. There were plenty of actual orphans looking for homes. Having not seen this episode in quite some time I was worried that Frank was going to bond with Kim at some point. He didn’t, of course, which is good. That would have been too much. Considering how much Margaret enjoyed spending time with Kim, it’s almost surprising that she allowed him to wander off and make his way into the minefield while picnicking with Frank. Trapper watches Kim leave the 4077th. The novel Hawkeye is reading to Kim and everyone else in Post-Op is clearly fictional. The actual book he’s holding has no cover. I wonder who was responsible for writing the brief excerpt about Margo and the four hundred angels and the piano? According to Larry Gelbart in an April 2002 post to the alt.tv.mash newsgroup, Wayne Rogers did his stunts in this episode. You can’t really tell it’s him because of the distance. I wonder if there’s a good story about the writing of this episode. It’s credited to Marc Mandel and Larry Gelbart & Laurence Marks. If I understand the WGA screenwriting credit system correctly that means Mandel wrote a version of the script which was subsequently rewritten by Gelbart and Marks. That’s not unusual at all. What I find intriguing is the fact that “Kim” was the very first TV script written by Mandel and one of only two he ever wrote–at least according to his Internet Movie Database page. Lesley Evans made her third and final appearance in this episode. It’s clear that Nurse Mitchell and Hawkeye spent the night together in the Swamp, or at least a portion of it. She’s seen tucking in her shirt, isn’t wearing her dog tags, and worries that Trapper may have been awake the night before. I can’t recall offhand other episodes in which it was so blatantly obvious that a nurse actually stayed overnight in the Swamp. Maggie Roswell, who played Sister Theresa in this eipsode, is much more famous for her voiceover work, particularly on The Simpsons. And Momo Yashima, who played Kim’s mother, later made two other guest appearances on M*A*S*H.
Certainly a terrific episode for Trapper. I will add that the Henry Blake is ‘classic Henry’ in the mine field scene. I crack up everytime I see Henry struggling to read the map (which turns out to be the wrong map of course). It is a bit of a copy of Henry’s bomb defusing instructions in ‘The Army Navy Game’ from Season 1, but still funny nonetheless. Trapper’s frustration with Henry and his ‘three inch finger’ is tense, yet funny at the same time. As for Trapper mime-writing his letter too fast, they seemed to always mime-write too fast on the show, especially Radar when dictating something for the Colonel, or Hawkeye writing to his father. But, I digress, this was truly Trapper’s shining episode. As for the tag scene, I’m sure that Trapper’s decision not to adopt another Korean boy was because it was clear that he truly developed some kind of a connection and bond with Kim, something truly special that wouldn’t have developed had he suddenly been presented with another possible orphan out of the blue. It’s similar to how when people break up, their friends immediately try to hook them up with another person to take their mind off their exes to make them feel better, but it really only makes things worse. I’ve said before that I don’t find much that sticks out about Season 2, but this is perhaps my only go-to episode from that season in terms of watching over and over again. I particularly love the music that was used in this episode. More specifically, the music bed that was used in the scene after Kim was being driven away. That very music was used in several dramatic scenes on the show. Examples: The scene where one of the nurses delivered a breach baby…..the scene where Hawkeye gets off of Digger’s bus…..the scene where Charles reaches into his foot locker to take some pep pills. There are other scenes I’m sure that used that music bed. I have always wanted to have a copy of that tune, but no such luck yet. I doubt it’s available anywhere, so I guess in my case it’s only wishful thinking. Does anyone know the year, make, and model of the truck that sister Teresa was driving in this episode? I wonder if the twig Trapper steps on during the close up of his feet was deliberately placed to give the viewer a subconscious thought of a bomb tripwire being activated. Frank may not have bonded with Kim, but his shout of “Congeo” to get Kim to stay where he was sounded sincere to me. I agree, that was perhaps one of Frank’s most human moments ever on the show.